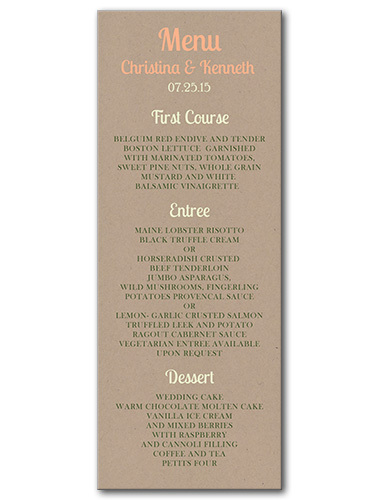 Announce your impending nuptials with finesse with our Garden Fresh menus. Love is in bloom with this stylish design, which features bold wedding font that keeps your message front and center. This can also be customized to suit your tastes and wedding theme. Choose to go with this design for invites, save the dates, table cards, response cards, and more for a fully tailored and coordinated wedding ensemble. Garden Fresh Menu For the best experience, we recommend personalizing your stationery on a desktop computer.